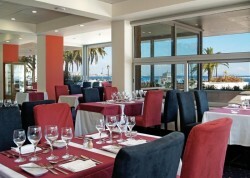 The Baia Grill Restaurant is generally acknowledged to enjoy the best town-centre location in Cascais, Portugal. Located on the ground floor of the Hotel Baia Cascais the restaurant is large, light and airy and opens out onto a broad terrace with sweeping views out across the bay. This award-winning restaurant firmly deserves its prize from the Estoril Tourism office for quality in gastronomy. It offers a relaxed ambience where the focus is on preparing the best of traditional Portuguese and international cuisine to high standards whilst retaining a keen eye to ensure that prices remain as accessible as you would expect from its three-star hotel location. As with most restaurants in a beachfront and marina setting, there is a strong emphasis on fish and seafood. The daily catches are carefully picked out at the local fish market ready to be transformed into mouth-watering dishes guaranteed to tempt the many diners the restaurant welcomes for lunch and dinner each day throughout the long summer season. The varied menu offered by house Chef, Manuel Fernandes, offers something for all tastes. House favourites include the “Espetada de lula com gambas”, a delicious grilled skewer of delicate squid and prawn, “Robalinho grelhado com molho Tártaro”, grilled seabass with fresh tartare sauce and “Garoupa corada au Armandine”, golden grouper with almonds. Meat lovers will enjoy the pork Milanese, a tasty pork escalope cooked to perfection, turkey with mushrooms or skewered, rolled veal cutlets with bacon, something of a favourite in Portugal. The Baia Grill Restaurant offers an extensive wine list full of tempting vintage and younger bottles from which to choose the perfect accompaniment to your meal. The service is friendly and attentive and the waiting staff are happy to make suggestions from both the food menu and the wine list. 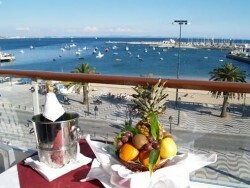 The Baia Hotel is famous for its sunset lounge parties in the rooftop poolside Blue Bar. Arrive early and sip a cocktail as you admire the view over Cascais and watch the sun slip down beyond the Atlantic horizon on its way to the Americas. 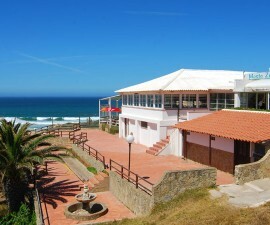 This is probably the best location in Cascais and is unbeatable for a town centre hotel and restaurant destination. 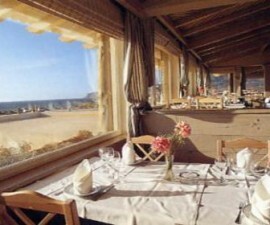 The Baia Grill Restaurant has capacity for 80 and booking is advisable at peak times. 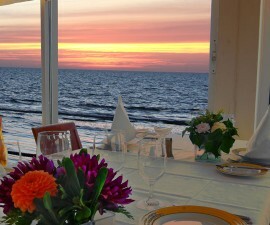 Book a room to ensure you can continue to enjoy the lovely view even once your meal is over. Open seven days a week for lunch and dinner during summer months only. Lunch served from midday until 3.30pm and dinner from 7pm to 11pm.